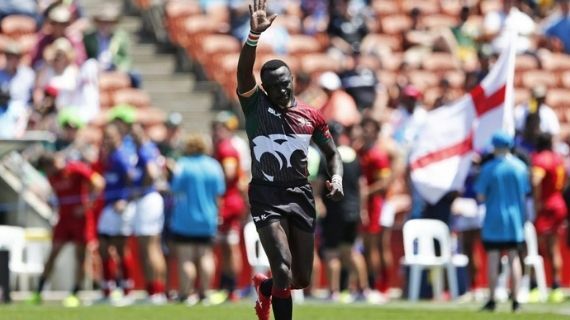 Shujaa's dream of winning the Hong Kong Sevens will have to wait a little longer as a dominant Fiji 7s beat them in the second final in a row at Hong Kong Stadium on Sunday. Amenoni Nasilasila was the destroyer in chief as he scored three tries to give Fiji 17-0 half time lead. The script was made even harder for Kenya as they lost Collins Injera and Willy Ambaka to yellow card thus having to fight two men down. A reply try by Billy Odhiambo and Oscar Ouma late surge for a try could only give the Kenyan fans a consolation as Fiji won 24-12. Kenya and Fiji met in the Vancouver sevens final in the last leg.Kenya beat New Zealand in the semi final while Fiji edged out South Africa. For reaching the finals, Kenya earned 19 points which brings their HSBC World Rugby Sevens Series total points to 83.